Some people may think that new iPad is luxury item. But its none if compared to this version of third generation iPad. This iPad comes with gold plated casing. The price is priced at $ 5,500. This is special iPad that available in London, Hong Kong and Dubai. New gold-plated iPad itself first appeared at an event in United Arab Emirates. After the show, there were several orders coming from jewelry store named Damas Jewelers store in one mall in Dubai. 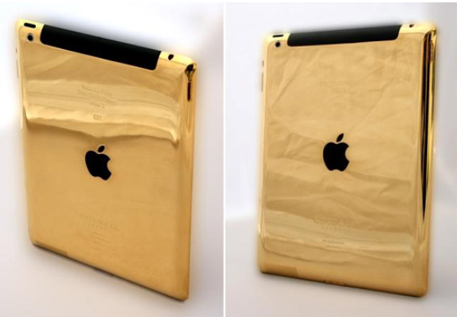 This 24K gold-plated New iPad has highest specification. Its support 4G + WiFi with hard drive capacity of 64 GB. The difference with usual new iPad only the casing. There is no differ in specification at all.